Caitlyn: "I think dragons are like other animals. The boys fight for the girls." School has been celebrating Lunar New Year, so dragons are a frequent topic these days. Caitlyn: "Uh-huh." Her voice gets all dreamy. "N. fought for me today. He won." Me: "So, you're going to grow up and marry N. now?" I wonder what the young man in question thinks of this. He probably has no idea. Washington's state constitution says, "[i]t is the paramount duty of the state to make ample provision for the education of all children residing within its borders..." (Article XI, Section 1). We had one federal holiday and three and one-half snow days last week. Caitlyn went to school for a grand total of 2 hours. We were scheduled to have a school holiday this Friday (I'm not sure why), but that has now been canceled. School will be in session on Friday as a make-up day for one of the snow days last week. If you've already made plans to do something else with your day off, it's time to cancel those plans. Somehow, though, it still made sense to Those Who Decide that today would be a half-day. This half-day was scheduled in mid December and was not part of the previously published district calendar because it was determined more recently that the district needed a furlough day. The district is so short of the necessary funds that it felt it best to shut down for half a day. I think this is a clear case of the State failing in it's "paramount duty". Not to mention a bit stupid. If we can cancel a planned holiday to make up for a snow day, why not cancel a furlough to make up for the snowed out half-day from last week? So there was a half-day at school today, regardless of how inscrutable the decision might be. And we'd arranged for Caitlyn to go home with a friend and have some unstructured social time. But the friend was late to school and Caitlyn assumed this meant her friend was absent. If her friend was absent, she couldn't very well go home with her, now could she? Caitlyn didn't turn in her note from home with the special end-of-day instructions. When she discovered at lunch time that her friend was indeed at school, she thought it was too late to turn in her note. So she got on her usual bus, albeit three hours early, and came home. She planned to ring the doorbell, since she knew we weren't expecting her, explain how her friend wasn't there at quiet time and then have Mama walk her to her friend's house. Which is a beautiful plan. Except that Ian and I went out to lunch. I suppose this is a common enough thing to happen to a parent. It's just never happened to me. I don't even remember something like this happening to me as a kid (although my memory of being a kid is admittedly spotty - I've been going on 45 since I was about 12, I think - and my mother may have a different story). When the friend's mother called to let me know that Caitlyn wasn't where she had expected her to be, Ian and I were at least 30 minutes away from home. We stood outside the restaurant, both of us on our phones, trying to find someone closer than us. There weren't nearly enough numbers in my phone to try; all of them took too long to go to voicemail. I hung up on a lot of voicemail greetings. I thought about heading for the train station and starting home, but that would have put me underground for half the trip home, where my phone wouldn't work. Still, I kept almost starting for the station since standing outside the restaurant, making phone calls, was driving me crazy. I couldn't possibly be doing enough. Where was Caitlyn? Which friend from the bus would she have gone home with when she couldn't get in at home? What was I going to tell her when I found her? How was I going to make this, this betrayal of my Mom Duties, better? Caitlyn was found by her friend's mother and by her aunt in our backyard, about 15 minutes after she'd gotten off the bus. She made a good choice, staying put, when no one answered her at the front door. I didn't mean to cry when she got on the phone, since I figured she was already probably freaked out enough, but of course, I did. Not a lot. I managed to tell her I was sorry, so sorry, that she'd done the right thing staying near the house, with my voice only wavering a bit. By then, she'd remembered that we go out to lunch on Tuesdays and was curious where we were. Not just what part of town, but which restaurant and what did we eat and was it any good? We'd had giant burritos, I told her, and she'd done the right thing, and I was sorry, and she should go have her playtime with her friend and I'd see her later when I came to pick her up. Then I hung up and sobbed. It's hard, even now, at the end of the day, to let go of the guilt. I wasn't where my daughter needed me to be, when she needed me. It's completely impractical, but I can't help thinking that I shouldn't have gone to lunch today, on furlough day, when things were Not Normal. I'm familiar with the idea that, as a parent, inevitably, at some point, I'm going to let my child down. I didn't expect it to happen so soon (which probably also means I get to do it again and again in the coming years). And I didn't expect it to break my heart. Sometimes, when people find out I sew, they gift me with the remnants of their abandoned fabric stash, or perhaps one they have inherited. 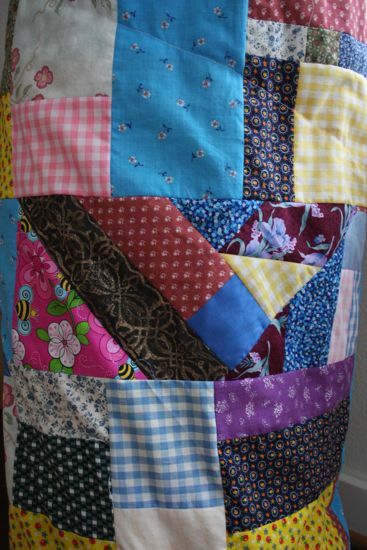 This can be a fun way to get new-to-me fabric - for free! Sometimes, I get some wonderful stuff this way, like the most of the fabric I used for the candy bags for Christmas last year. I've carried these fabrics around for more than a decade. I'm pretty sure I've never liked them. Especially that yellow apple print. Shudder. But letting go of things is a skill I've only recently started working on (it's a bit easier now that I know I don't have to automatically throw away the fabrics I don't like - there are thrift stores that will take them and, apparently, judging by the number of sewing blogs about things vintage, a small army of people who might buy them), so I kept the fabric that I didn't like, figuring sooner or later, I'd settle on a project that would use it. We have a foam pad that lives in the attic, all rolled up. Attics being generally dusty places and the idea being that this pad would be something people might sleep on, I thought it needed some sort of storage cover. And just like that, I found a use for these fabrics I didn't love. A bag that would live in the attic would get dusty and probably bleached by the sun (our attic has windows). If it were in fabric I didn't love, I wouldn't be heartbroken when time made it ugly. It would be ugly to start! Right about the time I came to this grand conclusion, I discovered Scrap Attack over at Stitched in Color. Why make a storage bag thing out of large pieces of fabric I didn't like when I could make it out of many more smaller pieces of fabric I didn't like??? I think it's the ugliest useful thing I've ever made. I like some parts. 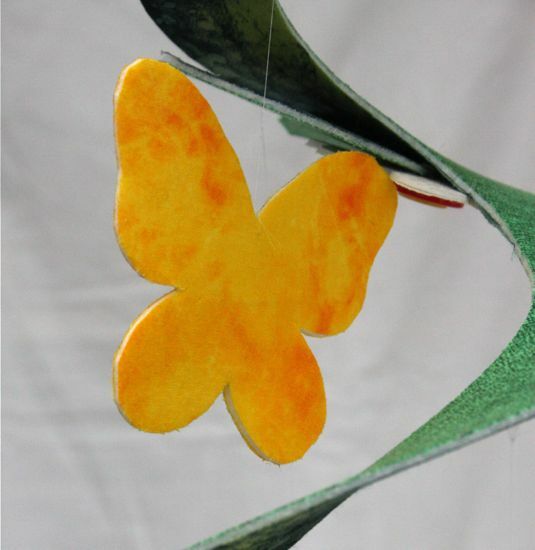 I used the two pieces of muslin from Caitlyn's and my adventures in leaf printing. 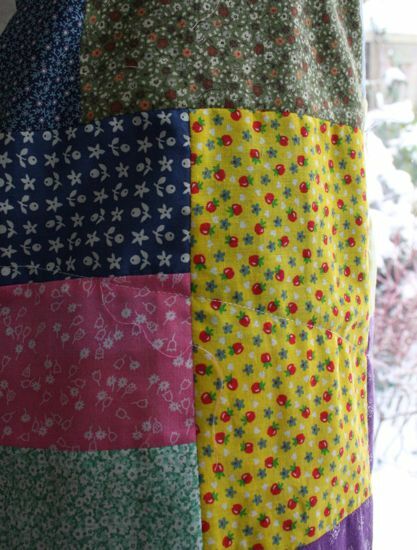 And I used scraps from the scrap bin in addition to trying to use up things like that yellow apple print. So there's a bit from a nightgown, a school dress, a Halloween costume, and a toddler dress in here, too. And since I was taking the Scrap Attack approach, sometimes the pieces got really tiny. Which might be something to keep in mind next time I luck into someone's fabric castoffs: make the pieces small enough and almost any fabric can be palatable! Although I don't know that even that would have helped with those darn apples. Caitlyn got her wish. 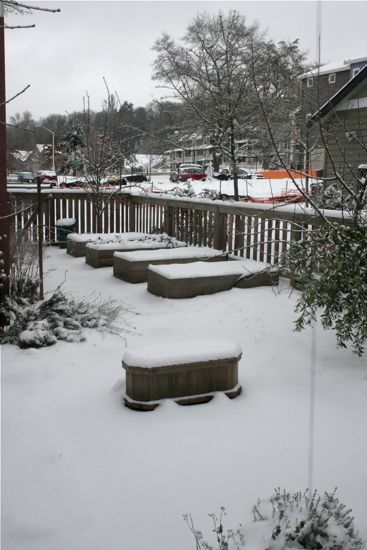 It has, however unlikely, snowed significantly on Seattle. Given that snow like this is unusual, everything around here shuts down. The train runs, but school is closed, and so are lots of businesses. It's oddly felt like a Saturday, over and over again, every day this week. It's still coming down now, although it's shifted back to snow after a stint of sleet/freezing rain that's left a sheath of ice on everything not already under snow. 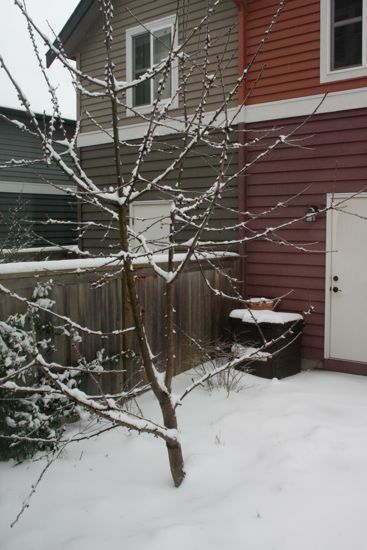 It's actually kind of pretty, the rim of ice on branches and stems, although I worry about my fruit trees losing a limb. The dormant decorative grasses are silvery with ice, and the north-facing Oregon grape leaves are drooping under a quarter inch of ice. The weather folks say that the snowfall will shift to rain tonight, and tomorrow will be about 20 degrees warmer than today. Looking outside, that seems impossible. But then, it's a magical wonderland out there now, and once the snow stops falling this sense of stepping out of reality will disappear. It'll be icky gray slush as everyone rushes out to squeeze the some of their abandoned To-Dos into the last shreds of the week. I know everyone has moved on to new projects (new year, new goals, new determination! ), but I'm still wrapping up/catching up. I've got one last gift post and then I can move on to the Things I Didn't Do Because I Was Making Caramels post(s). By that time that's done, perhaps I'll have a post for Something New Made in January. Maybe. Because you can't give caramels to kids who don't have teeth yet. Caitlyn helped with the fabric selection and with some of the pressing/fusing. I try to get her to slow down when counting seconds by asking that she count hippopotami, which she thinks is absurd. There are no hippopotami here, Mom. 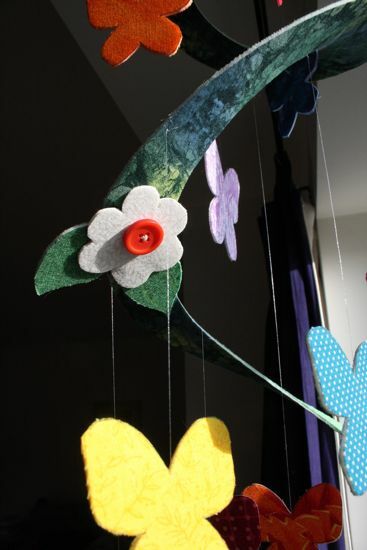 But she did enjoy delivering the mobile to her cousin, pointing out that the flowers are best viewed from directly underneath the mobile and that it should be hung just out of reach of little arms and legs. Which shouldn't be too hard since Caitlyn's cousin isn't all that big yet. It's probably going to be a problem when she's a little older, though, since the whole mobile is not that much shorter than Caitlyn is tall. (Whoops!) Hang it from an average ceiling and anyone much taller than 4 feet is going to walk into it. She took her time with this drawing and chose not to fill in the sky, both of which are historically unusual. She told me she'd decided not to color in the sky since she didn't want to totally use up her new blue pencil. I told her it was a perfectly valid artistic choice and that sometimes what leave uncolored is as significant as what you do. At least, that's what I tried to say. I probably used too many words. I did use lots of words to tell Caitlyn how much I liked that she'd taken her time, though, and that she'd been careful in her work. 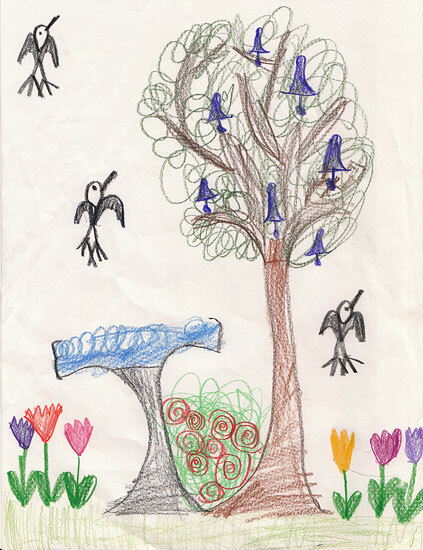 Favorite parts: the bluebells in the tree (they've been mentioned in The Secret Garden, which we are reading at bedtime, but she's not seen a picture of them - I love how this drawing shows how she imagines them, and I wish I could tell her she was right! ), the stylized birds, and the rose bush (with the red spirals - what a clever way of expressing the complexity of rose flowers!). In other Creative Caitlyn news, she and Ian created this short stop-motion animation, using some of the Lego sets which arrived for Christmas. Ian operated the camera and Caitlyn did all the animation. She's enormously proud of this video! When we finally got around to marking the winter solstice last month, Caitlyn greeted it with the largest pout imaginable. I suppose she's got it in her head that it snows regularly in Seattle because we've had snow for three years running, at least. We had snow in 2010, lots in 2009, and more in 2008. That's three years in which enough snow for local sledding has come to Seattle at least once. Of course, there's still the rest of January and February before the possibility of local snow gets so slim as to be essentially zero. So, we made our own. 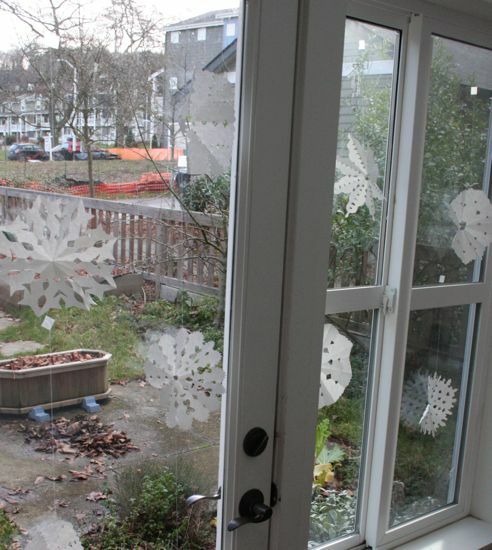 In the meantime, we have these big paper flakes, forever fluttering over the backyard. I sort of fell off the Internet there for the second part of December. Wanna know why? After last year's first attempt was deemed a success by my candy-making grandfather, and with his candy-making tools in hand (omg! marble slab ftw! ), I picked up the family Christmas candy tradition. I've always thought that someone should carry on Grandpa's candy making; if it's me, I get to claim the extras. I guess there's an ulterior motive for everything. Grandpa made caramels for years. I remember there were a few years when I was a teenager (I think) when he made all sorts of candies: brandied apricots and crystallized ginger and truffles and chocolate covered cherries. 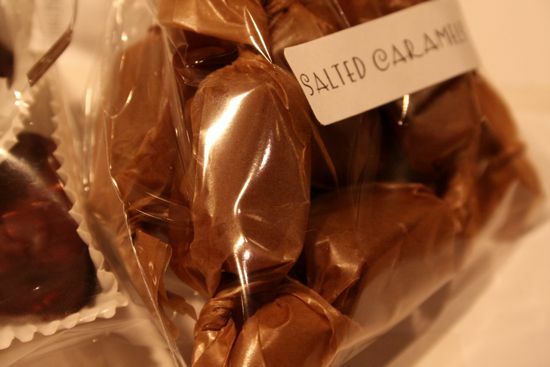 The caramels were a staple. I made three batches according to his recipe and then off-roaded a bit to come up with a salted variation, which have generally been well received. Those who really like salted caramel think I didn't add enough salt, but those who don't really like the stuff think there's just enough salt to make the caramel flavor pop without being too salty. I might try a version next December that's slightly less salted and a version that's slightly more salted. See how that works. 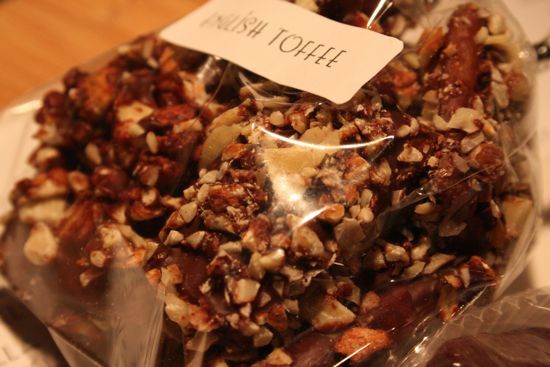 I made English toffee, of course, because I can't imagine Christmas without it. Maybe the rest of my family doesn't have this problem. I don't think they are complaining that I do. And this year's new addition: nougats! Sugar in several forms, mixed with whipped egg white, folded around chopped cashews, then dipped in chocolate. The stuff is amazingly hard to cut into bite-sized pieces. A two-handled knife would help. Beyond that, I'm not sure. Warm nougats stick to the knife. Cold nougats shatter when cut. Ideas? Oh, and please take a moment to admire the packaging. I'm ridiculously pleased with myself for the presentation of my candies. Simple but elegant. Much better than Ziplocs. And speaking of presentation, remember this project? Grandpa's Christmas candy always came in red paper gift bags. 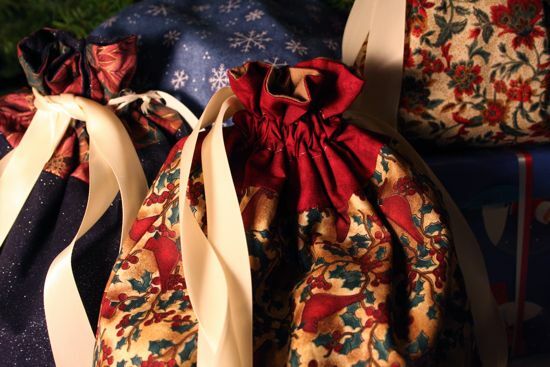 I decided to put my own spin on the tradition and made fabric bags. I used Jeni's tutorial over at In Color Order (although I forgot to put the gussets in on all of them!). I'm super-pleased with how they came out and have serious ambitions about making these bags part of the candy tradition. After making the dozen I did this year, I felt a bit cheap relying on the tutorial, so I now have my own purchased copy of Jeni's pattern (Thanks, Lianna!). 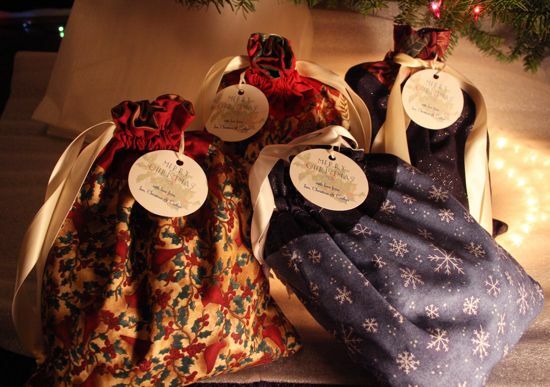 This may be the future of gift-wrap around here. And I may finally have a reason to go to those Christmas in July sales and stock up on holiday fabric. Although I made all of this first group of bags out of stash fabric, so maybe not right away. So, there you have it: I fell off the Internet and into the kitchen and the sewing corner. And now it's January and while I'm done with the candy-making (although maybe Caitlyn and I will make a batch of something unusual sometime), I'm planning on keeping up with the sewing. More on that later. Excuse me. 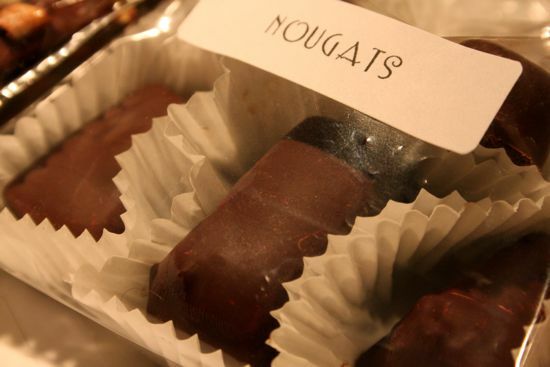 I need to go eat a leftover nougat now. After last night's bedtime stories, Caitlyn rather randomly asked about seasons. Something like, "Why is it cold in the winter and hot in the summer?" So I did a quick overview of the Earth's axis being tipped off of vertical and the resulting annual wobble as the planet revolves around the sun. I'm always pleased with myself when I review this topic with Caitlyn since I inevitably try to illustrate the not-vertical nature of the axis by physically leaning to the left. Maybe I'm 23 degrees off vertical, maybe not. But thus far, I've managed to not fall down. That seems the critical part. This seasons question is not a new question, so I didn't spend a lot of time on it. Caitlyn was a smidge disappointed that I didn't revolve and rotate while leaning into my personal approximation of 23 degrees, but it was bedtime. As I headed for the door, she asked another question, quick-like, like if she kept asking, I wouldn't leave. "Is lightning hotter than the sun?" "It says so in a true book at school." "Oh. I'd have to look it up." "How do they make paper?" "We'll have to ask the Internet." "Who was the first person on Earth?" At this point, I was thinking, Great. I need to do a nutshell overview of various creation stories and cover millions of years of evolution and tonight's a school night and it's late and man, do I need to pee. Caitlyn barely slowed down, though. "'Cause people have to come from somewhere. They start as babies and then they grow and then there are more babies. But where did the first baby come from?" "Ah. You have discovered the Chicken and Egg Problem." "Where do chickens come from?" "But where do eggs come from?" "But where did the chicken come from? "Ah. But where did the egg come from?" She was giggling now. "A chicken!" "Hmm. But where did the chicken come from?" This was the funniest thing she'd ever heard. "An Egg!"